Most of our trip was near the ocean. We did stay inland once, but even then we were only about 30 minutes from the ocean. Our first stop was at the campground in El Chorro Regional Park, a San Luis Obispo County park. This is a beautiful campground that’s just off of hwy. 1 between San Luis Obispo and Morro Bay. 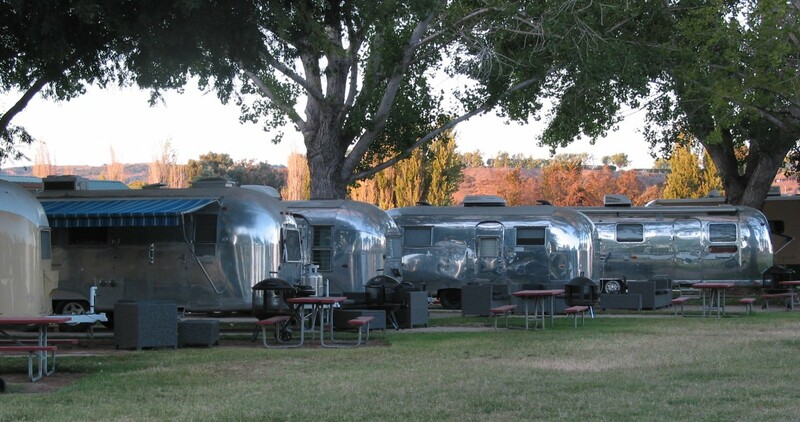 The best campsites appeared to be R10, R11 and R12 (the nicest). Just don’t book campsite C2 if it looks like rain. We lost our awning in C2 the second morning of our 2 week vacation due to my not having put enough slope in the awning when I opened it up (see problems and fixes, “How to trash one side of your Airstream”). Overnight, rain filled the awning and the weight snapped the awning supports. A very strong torrent of mud-laden water raged through this campsite making things miserable while I took the awning apart. There’s a lot to see around El Chorro. You can enjoy a nice 2.4 mile roundtrip hike to Eagle Rock Viewpoint (you can see Morro Bay from here), visit a botanical garden (next to the campground), play golf, go to Morro Bay or visit any one of several near-by beaches. We hiked the Eagle Rock Nature Trail to Eagle Rock Viewpoint. The payoff is beautiful views of the Chorro Valley, Hollister Peak and Morro Bay. It takes about 1 hour to get to the Viewpoint and the trail climbs about 450 feet. It’s a fairly easy hike. Besides visiting Morro Bay, which is a given when in this area, we went to Montaña de Oro State Park for a hike along the bluffs overlooking the beach. The park is six miles southwest of Morro bay and presents some absolutely stunning views. In one of the pictures, you can see Morro Bay. Moss Landing was our primary destination and our second stop. It’s about 15 miles north of Monterey, California, on hwy. 1. Sometime around 1866 a guy named Charles Moss moved his family from Texas to California and homesteaded this spot. I guess that’s where the name Moss Landing originated. Originally, it was a whaling port but now it’s a fishing village and tourist destination. About half way down the campground road is an entrance to the marina. There are restaurants, boats and sea critters in the marina. You hear the Sea Lions talking to each other all the time. We always visit the Monterey Bay Aquarium when we are in this part of California. If you haven’t been there, you are missing out. Before it was an aquarium, it was a sardine cannery. I believe it became an aquarium in 1984. The feature exhibits are a 28-foot-high, 333,000 gallon tank for viewing California coastal marine life and a 1,200,000 gallon open sea tank. They even have ocean sunfish which are very rare in captivity. I could stare at these things all day. It’s especially interesting when a diver is in a tank feeding the residents. The diver has a microphone and talks with the audience. Just south of Monterey is Pacific Grove. We love the beaches here and always find time to visit when we are in the area. Probably the most visited trail in Pacific Grove is the Monterey Bay Coastal Recreation Trail that is about one mile long and goes from the Monterey Bay Aquarium to Lovers Point. This is a walking, bicycling trail that offers marvelous ocean views and is an easy walk, but it’s too crowed for us. We prefer hiking the beach trails on the Sunset Drive side of Pacific Grove. This area is gorgeous. Here you have neat tide pools, ocean views, interesting plant life, and very clean beaches. Before we had a travel trailer, we used to stay at the Lighthouse Lodge in Pacific Grove. At that time they allowed pets, and probably still do. Our first family dog, Bear, loved Pacific Grove. He could smell Pacific Grove in the air and would start getting excited about the time we got to Carmel. He would get royally P.O.’d if we left him in the room when we went out. One time when we came back to the room after an outing, Bear had ripped down the curtains, knocked over a chair and peed on our daughter’s pillow. He wasn’t a big dog, but he sure had a big dog attitude and he didn’t hesitate to let you know how he felt. Our first family dog, Bear, at Pacific Grove. This was his favorite place of all. R.I.P little buddy. Following are some pictures taken from our favorite Pacific Grove hiking trails. San Simeon State Park was our first stop on the way home. San Simeon State Park is near the city of Cambria, on the California coast near Hearst Castle. There are 115 campsites in the The San Simeon Creek Campground. Each campsite has a fire ring and picnic table. Because of the messed up water situation in California, there were no flush toilets or shower facilities. Chemical toilets were available, but they get very ripe if you know what I mean. The dump station was open but was subject to closure as well. Make sure your fresh water tanks are full as there was no water available during our trip. If you are self contained it’s no problem and the campground is very nice. The main attractions here are the Elephant Seals (they are BIG) and Hearst Castle. The beaches themselves are beautiful and hiking along the bluffs overlooking the beaches is a treat. I’ve talked about beaches a lot so I won’t go into the same type of detail here. However, on the beach up the road from San Simeon Bay are Elephant Seals, which are found at the Piedras Blancas Elephant Seal Rookery. If you’ve not seen one before in person, you’ll be amazed how big these bad boys are! The elephant seals found here are the second largest seals in the world. Males are 14 to 16 feet long and weigh 4,000 to 5,000 pounds. Females are smaller, about 9 to 12 feet long, and weigh 900 to 1,800 pounds. Pups are 3 to 4 feet long at birth and weigh about 70 pounds, ouch! These things are something to see on the beach, especially when they are moving around. Most of the time they lie on the beach looking dead. Every once and a while however, two males decide to duke it out. I’m betting one of the girl seals starts it and these guys have to protect her honor. Anyway, they go at it in a loud and vicious manner. Here is some video of 2 males settling a disagreement. It was really windy on the beach. Hearst Castle is close by and a must see. If you’ve seen the classic movie “Citizen Kane”, then you have a good understanding of the history of this place. Architect Julia Morgan designed it and built between 1919 and 1947 for William Randolph Hearst. Hearst was a very rich newspaper magnate who died in 1951. We’ve visited the castle and I can tell you that there is just too much history for me to cover. This place is huge, had it’s own exotic animal zoo and cost a boatload of money each day to keep it going. It’s well worth your time to see. We did notice that it’s getting a little worn looking. Since the State of California now runs it, funding is probably not adequate to maintain it as it should be maintained. Good old Flying Flags in Buellton, California. We’ve been here a couple of times and it was a good place to end our vacation. All of the campsites are pull-thru and have full hookups. You can walk to Split Pea Anderson’s restaurant or any number of other places. They have a store, laundry facilities, showers and friendly staff. It doesn’t have the feel of a State or National Park but a little civilization at the end of a vacation isn’t bad at all. Each time we’ve been here we have visited an Ostrich farm that’s just a few miles down the road. They also raise Emus. You can purchase all kinds of Ostrich/Emu things if you want and you can feed the birds. Watch your fingers however, both species are very aggressive. That ends our 2015 summer vacation. It was fun. As we become more and more confident about dry-camping, knowing what and how to pack and handling the unexpected, we plan longer and longer trips. After we both retire in 2016, we plan to travel across the Southern part of the USA with many shorter trips before and after. Maybe we’ll run into some of you on the road. If so, be sure to say hello.